Did you know we sell The Lewis Original? 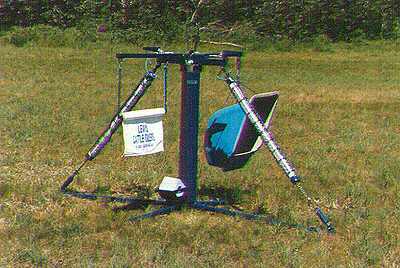 The Lewis Cattle Oiler provides effective year long control of all the major cattle pests. By controlling pests “The Lewis Way” the cost per animal is minimal and because it is a self treatment system you eliminate the stress factor caused by the extra trips through the chute other control methods require. It’s also convenient and saves time. The Lewis Cattle Oiler applies a topical insecticide to your livestock as they satisfy their natural instinct to scratch.The insecticide is rubbed into the coat right down to the hide. The insecticide leaves a residue on the cattle’s coat and hide to kill pests on contact. As fly season wears on, fly populations generally increase and unlike ear tags, which begin to lose their potency, the Lewis Cattle Oiler provides the opportunity for year long retreatment so the insecticide remains at full strength to kill pests as long as they are present. 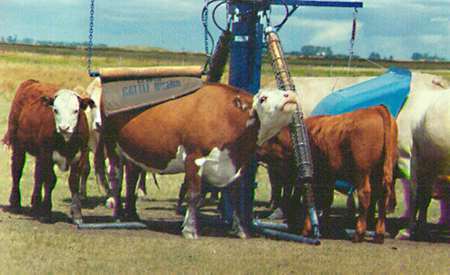 The Lewis Cattle Oiler is effective in controlling both orders of lice. It makes available the kind of year long treatment that’s required to effectively control both chewing and sucking lice. Furthermore, not just the initial control of adults and nymphs but also the ongoing retreatment that’s required to continue to kill the new lice as they hatch from the nits the adults left behind. Unlike the systemic louse control products, which should not be used when grubs are in the the esophagus or spinal canal due to host-parasite reactions, the Lewis Cattle Oiler can be used all year long. Face flies, blood feeding horn and stable flies and mosquitos are all controlled when they land on your cattle and come into contact with the insecticide from the Lewis Cattle Oiler.